Time to catch up on how theme-a-licious went for January. January’s theme was to work on something with flowers and or gardens in. I chose to work on English Garden and apart from the start I made on it for the crazy challenge I’m afraid I didn’t go back to it this month. 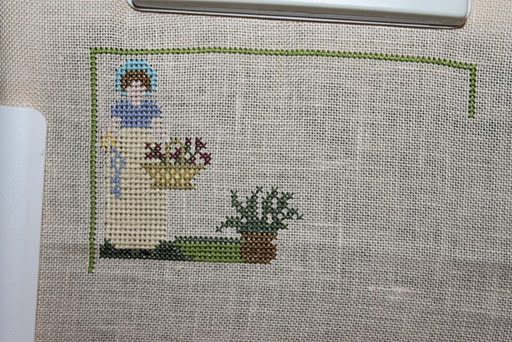 I did however put in the garden on my Mrs Darcy Sampler. It seems I worked on a totally different piece than I decided on at the start lol and I forgot a mid month update so here are some pictures before the garden going in and after. Mrs Darcy around the middle of the month with her garden and house put in. For February the theme is Fangirl February. Send a Valentine to your favorite designer…or at least work on his or her designs for the month! 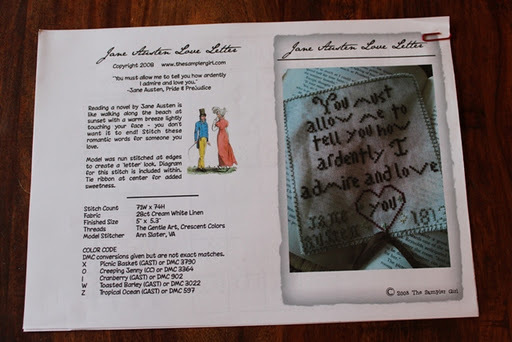 I did forget to add that both my Pride and Prejudice pieces are from The Sampler Girl. Remember if you want to join in you can check out the theme-a-licious blog HERE and I’m looking forward to checking in with everybody. I will be back tomorrow with an update on January’s goals and how they went and I will be setting out February’s goals. 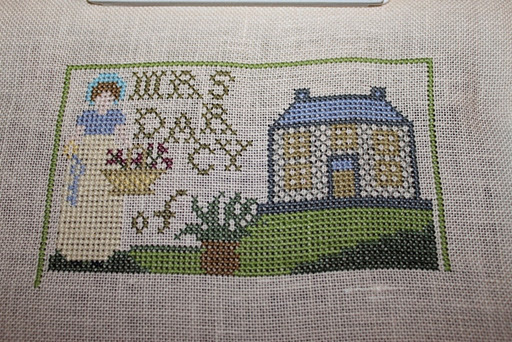 This entry was posted in Uncategorized and tagged Mrs Darcy Sampler., The Sampler Girl, Theme-a-licious. Bookmark the permalink. Great going Ruth…I love that Mr Darcy quote! You have great choices for your February theme! Your stitching looks wonderful! Great work in January and I will look forward to seeing your progress on the pieces you have chosen for February. Oh my, I did swoon a little when I read that last quote, LOL! 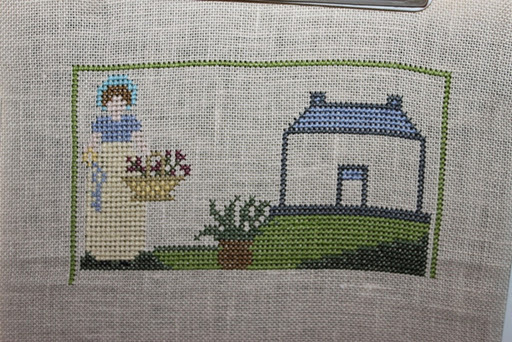 Your Mrs Darcy sampler has such pretty colors. You made fabulous progress this month! I haven't seen the Mrs. Darcy pattern before. I love it. Lovely work. I, too am P&P fan. I'll be watching your progress. I think I should follow your suit and stitch a little Jane. Oh my goodness! Your needles (knitting too) are fast & the finishes & progress are lovely, Ruth. You add energy to my stitching mojo…thank you. Looking forward to your Feb. stitching.